Notes: Measured from center of u-joint to center of furthest u-joint. Transmission joint has a double cardan CV. Stock driveshafts get power to the axles, but they aren't designed for tough off-road use. Yukon Gear & Axle performance driveshafts feature stronger tubing to help prevent bending or wear that could cause the shafts to become unbalanced. They include heavy-duty hardware, transfer case yokes, and either 1310 or 1350 U-joints. 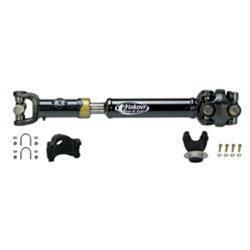 For better off-road protection, buy Yukon Gear & Axle performance driveshafts.